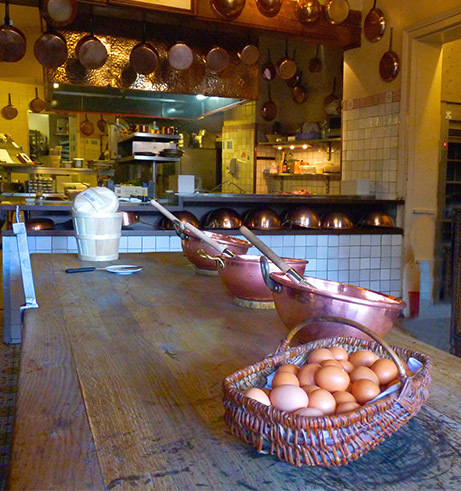 La Mère Poulard is an integral part of the history of Mont-Saint-Michel and of France. Annette Poulard fulfilled her dream of opening her inn, La Mère Poulard, at Mont-Saint-Michel in 1888, in the heart of the historic, medieval village that is part of the Wonder of the Western world. Her talents were soon acknowledged and she was given the honorary title of “Mère,” a distinction recognizing her great abilities in the kitchen and her contribution to the renown and culinary traditions of France. The name “Mère Poulard” was born, adding her to the ranks of other great female chefs, including the famous Mère Brazier of Lyon. Édouard Corroyer was an important French architect, a student of Viollet-le-Duc. Annette, the daughter of market gardeners from Nevers, in the region of Bourgogne, entered his service as a maid, later becoming his cook. Édouard Corroyer had gourmet tastes. He often welcomed guests to his home and loved to please them. He quickly spotted Annette’s culinary talent and told her about the dishes he liked. He also shared his knowledge of architecture and art with her. In 1872, Édouard Corroyer was commissioned by the government of France with the task of restoring the abbey of Mont- Saint-Michel. Indeed pressure had been exerted by leading French intellectuals, including Victor Hugo, to intervene and restore this national symbol. Annette would discover the Mont with Édouard Corroyer and his family. In 1873, Édouard Corroyer helped Annette and Victor Poulard, the son of a baker from Mont-Saint- Michel with whom Annette had fallen in love, to arrange their marriage in Paris as a token of grati- tude for the years the young woman had spent in his service.That same year, Annette and Victor Poulard acquired the Hotel Saint-Michel Teste d’Or, their rst establishment. There, Annette reinterpreted the re ned cuisine that Édouard Cor- royer loved, which was heavy and with great emphasis on sauces, turning it into simple and light meals lled with avors and colors. She crea- ted her own style of cuisine based on products sourced from the bay, between the land and the sea, between Normandy and Brittany. She served the architect, his young assistants, and visiting friends at the table reserved for inn guests, on the second oor. Édouard Corroyer would be for Mère Poulard what Édouard Herriot would be for Mère Brazier in Lyon several years later—a source of inspiration and an encourager of talent. walls and the rock, comprised a restaurant, bar, and hotel. The inn became a victim of its own success and was soon outgrown. Guests were also housed in three annexes located along the alleys leading up to the abbey: a red brick house, a whitewashed house, and a green house with ivy- covered walls. Mère Poulard would accommodate all her guests with the same kindness, the same hospitality, and the same spirit of sharing, famous or not. Father Couillard, the parish priest of Mont-Saint-Michel, described Annette as a mother who welcomes her children with willingness and genuine simplicity. She also welcomed the leading gures of the time, which visited Mont-Saint-Michel after its restoration by Édouard Corroyer. The Normandy coast in the late nineteenth century was the equivalent of the French Riviera today. It was where the British royal family and other nobility had second homes, soon joined by the elite among Europe’s monarchs, princes, and aristocrats. One would also rub elbows with great business leaders who had made their fortune, artists, painters, and writers. Annette ran her establishment expertly, and while she did not hesitate to offer credit to the poor, she was unyielding with certain rules. Meals, for example, were taken upstairs, and coffee was ser- ved at small tables outside. It is said that one day, while on a visit to Mont-Saint-Michel, King Leopold II of Belgium wanted to take his breakfast outside. Annette graciously but firmly made it clear to him that this was impossible. So he took his meal inside. Annette was always to be found in her kitchen, and only left Mont-Saint-Michel on rare occasions; she chose to leave her own travels to her dreams by listening to her guests who came from all over the world. She had the habit of asking them, as a memento of their visit, for a photograph, an autograph, or a drawing that would enable to continue to travel with them, her head filled with the memories of all those encounters that she so loved. This tradition has been kept up until the present day, and a large number of photographs, drawings, portraits, autographs, and dedications enliven the walls of the inn as an invitation to travel back in time and history. Through them, one can discover that King Edward VII and the British royal family, regular guests at La Mère Poulard at the turn of the twentieth century, greatly contributed to her renown. Both President Theodore Roosevelt of the United States and Prime Minister Georges Clemenceau of France — hero of World War I, a close friend of Annette Poulard, and a big fan of her cuisine —also contributed to her growing fame. Within a few years, they might have encountered the Russian revolutionary Leon Trotsky during his exile, who in turn could have run into the great banking and industrialist families — the Mellons, the Rothschilds, and the Rockefellers — who were loyal to La Mère Poulard throughout the twentieth century. Among the royals who frequented La Mère Poulard were the Prince and Princess Takamatsu, of the Japanese imperial family, and numerous Russian princes and princesses in exile after the revolutions of 1905 and 1917, where they drowned their sorrows with merry soirees that would end in the early hours of the morning. There is no doubt that Annette Poulard would have appreciated that on the occasion of the centenary of the founding of her inn, the Prime Minister Margaret Thatcher of Great Britain and the President François Mitterand of France came together there over a delicious omelet to discuss the world’s problems. Likewise, she would have been proud to hear that her establishment had accommodated the Allied liberators after the 1944 Normandy Landings, and that in the difficult years that followed, General Patton, General Bradley, and Field Marshal Montgomery had enjoyed their meals. Ernest Hemingway, the American writer and highly committed war correspondent, would regain his strength at the inn of La Mère Poulard, so that he could go on to describe the events of the landing, including the famous breakthrough by General Patton in one of the decisive battles for the liberation of France and Europe that took place a few miles away from Mont-Saint-Michel, at Avranches, which was completely destroyed at the time. Finally, we cannot overlook the great achievers whom Annette Poulard so admired, such as Charles Lindbergh after his Atlantic crossing or Alan Shepard, who had journeyed into space before coming to dine at La Mère Poulard. Hosting is an ancestral tradition of Annette and Victor. 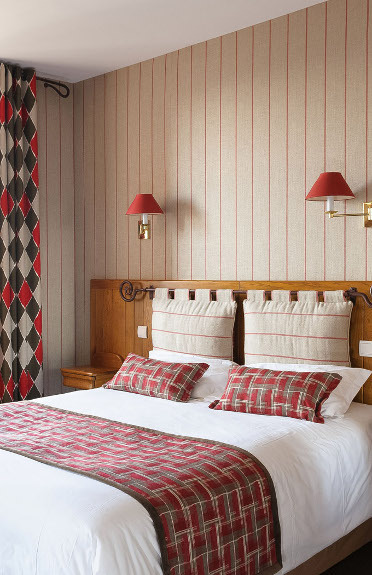 Discover our typical rooms at the heart of Mont-Saint-Michel. 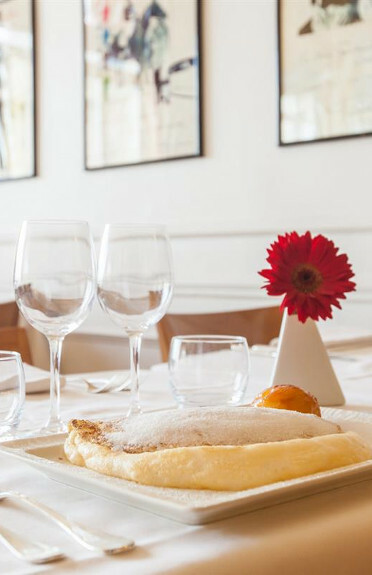 Our restaurant immortalizes Annette’s culinary tradition by offering delicious and generous traditional cuisine to visitors from around the world. 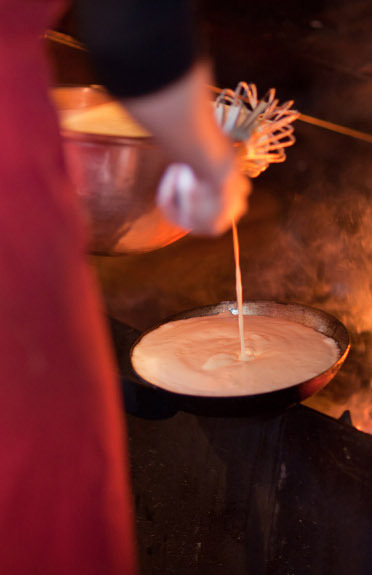 Annette’s specialty is her world-famous puff omelet cooked over a woodfire, the recipe of which has been kept secret for 130 years.